John Gosden’s string are just clicking into gear and he looks to have solid claims with Precious Ramotswe in the EBF Stallions Breeding Winners Fillies’ Handicap at Brighton. Owned like Golden Horn by Anthony Openheimer, the lightly-raced four-year-old has only managed three starts to date. She got her career off to the perfect start at Kempton in December 2016 when winning a one-mile maiden comfortably. Unfortunately she was held up the following season by a series of niggly problems and was not back out until the following October, when she won a Newbury handicap off a mark of 81. Attempting to back up very quickly less a month later, she ran no sort of race in a Listed contest in France but was beaten far enough to be able to say she did not give her true running. Back in handicap company and closer to home she should be able to get her career back on the right track, before the search for black type will be on the Nathaniel filly’s agenda. Mick Channon appears to have a very good team of juveniles this term and his Chynna should take plenty of stopping in the 100% Profit Boost At 32Redsport.com EBF Fillies’ Novice Stakes at Kempton. 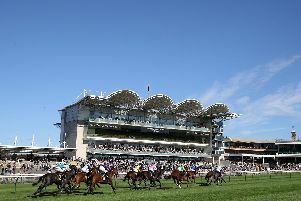 Izzer and Kinks have already won twice apiece and given how well Chynna ran in a Newmarket maiden at the Craven meeting, it will not be long before she is off the mark. By Gregorian, who has made a cracking start to life at stud, she was beaten less than two lengths by Charlie Appleby’s Strings Of Life, who was being talked of in terms of Royal Ascot. She can put that experience to good use in a winnable race. Chessman has not been seen since finishing seventh of 20 in the Jersey Stakes for Gosden and he makes his debut for Archie Watson in the 32Red British Stallion Studs EBF Conditions Stakes. Watson has made a rapid start to his training career but it will be a real feather in his cap if he can improve one from the master of Clarehaven. Strictly on the figures he has a mountain to climb against Jallota and Arod, but he arguably has more promise. James Bethell’s Harrogate shaped with promise on more than one occasion last season without getting his head in front. He was a little disappointing on his seasonal return over five furlongs, but with that run under his belt, an extra furlong to tackle and 2lb off his back, better can be expected in Newcastle’s 188Bet Summer Partnership Download The App Novice Median Auction Stakes. The ground will be very soft at Nottingham but that has never stopped Tim Easterby’s Multellie, who is beginning to look well handicapped for something like the Bet & Watch At 188Bet.co.uk Handicap. At Yarmouth Rae Guest’s Salt Whistle Bay ended last term in great form and can hopefully pick up where he left off in the Weatherbys Global Stallion App Handicap. BALLINROBE: 5.35 Papal Motel, 6.05 Grandma Dotty, 6.35 Last Minute Man, 7.05 Cottonvale, 7.35 Last Encounter, 8.05 Rashaan, 8.35 Castle North. BRIGHTON: 2.20 Wedding Date, 2.50 Rocky Shores, 3.25 Rose Berry, 3.55 PRECIOUS RAMOTSWE (NAP), 4.25 With Approval, 4.55 Bounty Pursuit, 5.25 Archimento. KEMPTON: 5.45 Rajy, 6.15 Chynna, 6.45 Fortune And Glory, 7.15 Chessman, 7.45 Amazing Red, 8.15 Verstappen, 8.45 Cross Swords. NEWCASTLE: 5.20 Imperial State, 5.55 Gowanbuster, 6.25 Harrogate, 6.55 Hediddodinthe, 7.25 Testa Rossa, 7.55 Splash Of Verve, 8.25 Groundworker. NOTTINGHAM: 2.00 Red Handed, 2.30 Mushtaq, 3.00 Cosmopolitan Queen, 3.35 Seduce Me, 4.05 Double Reflection, 4.35 Multellie, 5.05 Dotted Swiss. YARMOUTH: 2.10 Artair, 2.40 Corelli, 3.15 Raven Banner, 3.45 Salt Whistle Bay, 4.15 Ramblow, 4.45 Banjo’s Voice, 5.15 Choral Music, 5.50 Screaming Gemini.